Here are images of my new sculpture, titled The Confusion' commissioned for the Woolf Institute at Cambridge University. Recently I was asked to design and make the awards for the honourees at the RA America gala in New York. 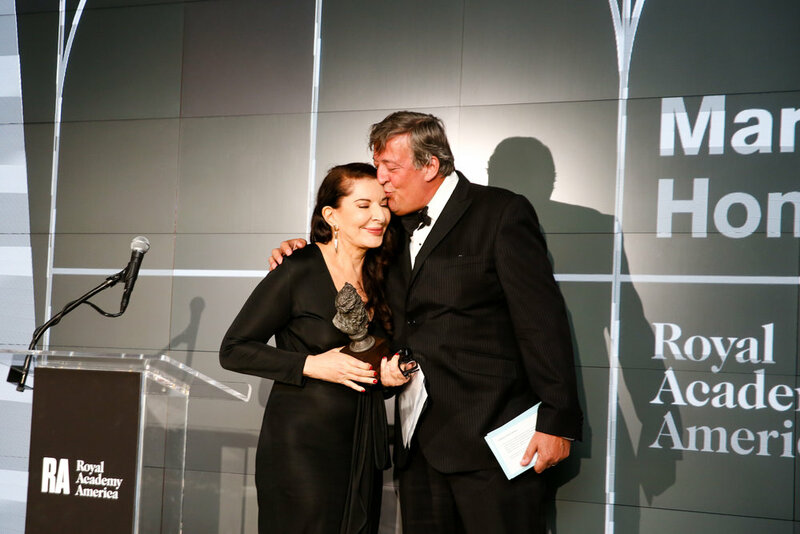 This year Marina Abramovic, Thomas Heatherwick and Aryeh Bourkoff recieved awards. They each were given a sculpture based on my sculpture The Hyper Real. Some images taken of new commission, 'Isometric Metropolis' installed at 11-12 Hanover Square, London. The lines are derived from a 3D digital wireframe model of that area of London and made from heat treated Ash. 'The Assimilation...' is a private commission just being finished off at London Bronze Casting right now. The final piece will have further editions for sale. Here are a couple of images and the essay from the show 'Island of the Real' at Gossamer Fog in Deptford. A joint show between myself and painter James Moore. Essay by Samuel Capps. “The Virtual is no longer the potentially real, as once it was. Non-referential – orbital and exorbital – it is never again intended to meet up with the real world. Having absorbed the original, it produces the world as undecidable.” Jean Baudrillard - Impossible Exchange, 1999. The undecidable world, built from synthetic models and simulated optics. Science Fiction wrote the base code for an artificial experience, and now it manifests in our minds. This is a materialised hyper-reality where science has now created its own fictions, substituting the real. Spatial cloning systems created by connected hosts and clients formulate speculative corporeal parameters. These interactions criss-cross the framework of Zachary Eastwood-Bloom's hidden infrastructure, presenting a compelling external clarity, that hides intrinsic complexities. Pylons electrify the ghost infrastructure that bends reality into an assemblage of tangled nodes. This network is an archipelago that contains the Island of the Real, surrounded by an ocean of liquid reality flowing between fraudulent simulacra and temporal voids. The anti-real slips into inorganic streams of consciousness, complicit with the metamorphosis; this is where the mirage appears. The vistas over this environment outline a mysterious island somewhere in the human psyche. Upon arriving at the shores of James Moore's 'Lost Coast' we can travel inland to 'Mount Analogue' and to the entrance of Plato's Cave. The cave is an allegory where prisoners inside mistake the appearance of shadows that are created for them by their masters as reality, not knowing what is the true reality outside the cave. Plato also says that the image lies somewhere within the 'third nature'; the point of intersection between the light emanating from the object and the light from the eyes. With Plato, it is the idea that is the real, the original model, while the actual objects we perceive are mere copies. At the base of the mountains lies Baudrillard's 'Desert of the Real' where the sun of a postmodern plurality beats down hard. If you can even survive the desert you may come across a winding dust track that leads down the Uncanny Valley to the crossroads of a re-programmed exchange, where the neo-real synthesis has already begun. This trompe l'oeil trickery is to become ubiquitous, except the eye is now probably a prosthetic and what we are looking at does not exist. I was recently asked to propose a large scale sculpture for a commission in Central London, here are some images and animations of the proposed pieces based on the Greek god Apollo. This year I was invited to enter a couple of postcards into the RCA Secret 2016 exhibition. Stewarts Law RCA Secret is a fundraising exhibition and sale of original postcard-sized artworks, by internationally acclaimed artists plus up-and-coming graduates and students from the Royal College of Art. It's a chance to get your hands on original works of art for a tiny price, while supporting students at a formative time in their careers. Each postcard in Stewarts Law RCA Secret is signed only on the back, so collectors don't know the identity of the artists until they have made their purchases. Here are some images of my 'Self-Portrait' entries. I have recently been selected for the 2015 Jerwood Makers Award along with Manifold studiomate Ian McIntyre, Jasleen Kaur and Malene Hartmann Rasmussen and Studio Silo. The artists were selected by an independent panel comprising Grant Gibson, Editor of Crafts magazine;Isobel Dennis, Director of New Designers – the UK’s most important graduate design exhibition; andMichael Marriott, leading product designer and curator. On Sunday the 14th of December 2014, concert pianist Alexander Soares will perform in conversation with artist Liz Miller. A series of etchings, part of the Classics on Vinyl series, will function as sheet music that can be read intuitively through shape and colour. This particular segment will consist of Soares’ musical reading and piano performance of Claude Debussy's Claire de Lune. Subsequently, sonic artist Chester Lusk will translate this musical score into a live composition with electronic analogue instruments. From 16th September - 25th October you can see my RA Edition 'Asklepios' exhibited at Advanced Graphics London, More information here.